MOON RECORDS – Located at 3331 Scenic Highway, Memphis, Tennessee. Moon Records began in 1956 in Memphis, Tennessee, and owner Cordell Jackson had previously recorded demos with Sam Phillips at Memphis Recording Service and Sun Studios. She is credited as the first woman to record, promote, engineer and produce music on her own independent record label and is revered as an early rock-a-billy/roots pioneer. Nashville producer and recording artist Chet Atkins provided advice to Jackson concerning the formation of her new label, Moon Records. Moon Records early stable of artists included Barney Burcham, Johnny Tate, Joe Wallace, Alan Page and Earl Patterson. CORDELL JACKSON - was born Cordell Miller in Pontotoc, Mississippi on July 15, 1923. Cordell received encouragement from her father who played fiddle in a string band called the Pontotoc Ridge Runners. She learned piano, stand-up bass and guitar and by her twelfth birthday had performed with her father’s band on a Tupelo, Mississippi radio show. Jackson also played mandolin, harmonica and banjo but is best known as an electric guitar player. In 1943 she married William Jackson and moved to Memphis. In 1947 Cordell purchased recording equipment from Kabakoff Radio and Appliance in Memphis and began writing and taping songs as well as jamming with other musicians. Unable to break into the Sun Records label's stable of male artists, she received the advice and assistance of RCA Records' Chet Atkins in forming this new label to release her music. She began releasing and promoting on the label singles she recorded in her home studio, serving as engineer, producer and arranger. The artists recorded included her and a small family of early rock and roll, rockabilly, and country music performers she recruited from several Southern states. Jackson began recording and releasing product in the late 1970's when she realized there was a demand for the early Moon singles. Her career received a boost from the rock-a-billy craze in Europe which brought her international attention. Tav Falco's Panther Burns covered ''She’s The One That’s Got It'' and ''Dateless Nights'' a song she originally wrote in the 1950s for Florida artist Allen Page, and she began performing with the band between sets. Jackson then began playing occasional shows in the 1980s with her signature red Hagstrom electric guitar as a solo artist in Memphis, Hoboken, New York, and Chicago nightclubs. She recorded new material on her label with Memphis musicians Colonel Robert Morris and Bob Holden, becoming known as a "rock-and-roll granny" solo guitar instrumentalist. An appearance in the movie ''Great Balls Of Fire'', Budweiser commercials, she appeared in 1991 and 1992 on national talk shows like ''Late Night'' with David Letterman and in a television commercial duelling with rockabilly artist Brian Setzer on guitar and Regis & Kathy Lee helped spread her image as the ''rockin’ granny'' twanging on her red Hagstrom electric guitar. Interviews with Billboard, Spin Magazines, MTV and Entertainment Tonight and others showcased her spitfire playing and personality. She marketed her own video singles through her label in the 1990's, including Dan Roses’ production of ''The Split''. Jackson is also featured in the film entitled ''Wayne County Ramblin''' by Dan Rose. In the late 1990s, Cordell co-wrote and played with the rockabilly icon, Colonel Robert Morris in Memphis. Colonel Robert also helped edit the book based on her life and career. 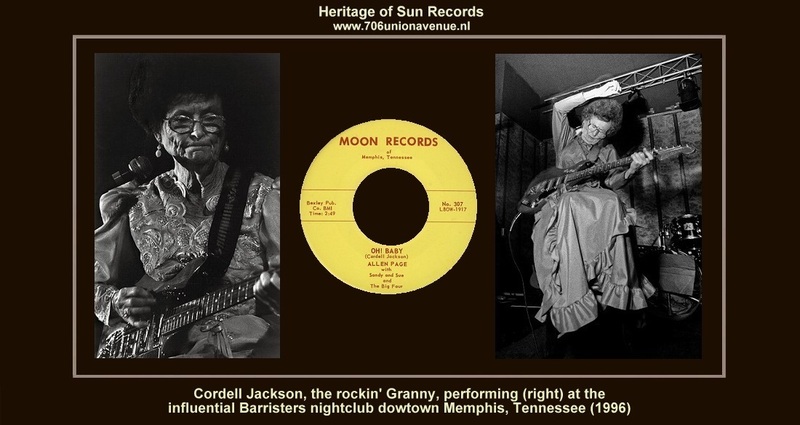 Memorabilia and information concerning Cordell Jackson and Moon Records are included in the Memphis Rock 'N' Soul Museum. Cordell Jackson died in Memphis, Tennessee, on October 14, 2004.